The social media age has proven to be a trying time. It's facilitated our growing perfectionism, which means young people may have a higher proclivity toward developing body image disorders (or general dissatisfaction). It's propelled our obsession with validation, so much so that we even get a dopamine rush when receiving a notification. Despite its promise of instant connectivity, with the array of apps that allow other users to judge our appearance and success, we're often left feeling lonelier than ever. Then, there's Huddle. Unlike other generations, however, we can appreciate most millennials are less ashamed to seek support, but still want to do so privately and cost-effectively. 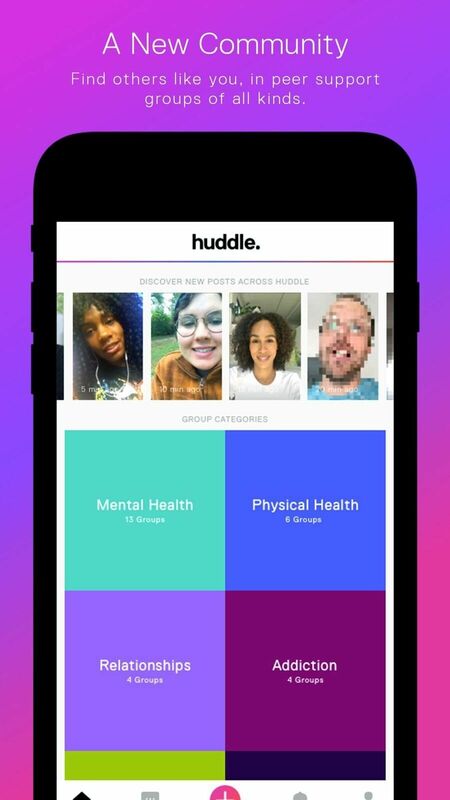 Huddle, a video platform for those seeking support to help themselves and each other, covers each need and more. As former Tumblr developers co-founders Dan Blackman and Tyler Faux understand the millennial market better than anyone and sought to subvert the traditional "therapy" app; Blackman clarifies their intention was for Huddle to be all-inclusive, sans the expensive subscription fees and the stigma that users might experience on these other platforms. Through a pixelated camera feature, Huddle can connect online with almost-complete anonymity (it, unfortunately, is yet to add a voice-disguising element). The app also requires you to sign in with your phone number or Facebook to get a jump on online bullying. While it can't for substitute professional, it's a "stepping stone" towards recognizing and addressing your struggle — and it may just connect you with someone whose able to gently point you in the right direction. We chatted to Huddle's Dan Blackman about his vision. What was the gap in the market where you saw Huddle could fit and thrive? What could Huddle bring to the table? Run me through the app's inception. It's a video-based app for people of all walks to find peer support groups. A place they can share their story, learn, and support others in similar situations. We believe that by giving young people a safe place to talk openly about everything from depression to sexuality, it will lead to people being more open to traditional type of therapy. We think of Huddle as a stepping stone towards getting real help — there are conversations and groups focused on everything from gender identity, to depression, to addiction. How have you seen your users respond to it? Have their been any kinks you had to straighten out that are indicative the way people approach or engage with the app? Overwhelmingly our users have been excited about Huddle and the community. By allowing users to pixelate their video and be as anonymous as they want when posting we see people sharing and telling stories they have never told before. It allows our users to work our situations, create a support system, share stories in clear video that influence others, and create real relationships that are focused on certain issues. The community has really grown a lot and taken a life of its own. A young person that doesn't mind talking about real life situations. A person that wants to support others and grow. What does the current support-app landscape look like? Right now we see a lot of "Therapy" apps that are still extremely expensive and stigmatizing for most people. Apps that focus on approaching therapy and conversation around mental illness in a traditional path... This leaves very few places where people (especially younger people) can talk and learn from peers who have been through similar situations. Were you ever worried it might be co-opted by users as a dating app or another social media destination? No. Most people coming through our on-boarding and seeing the app understand that it is focused on betterment. How can you see it shifting and developing over the next 10 years? Are there ways to ensure your app stands the test of time? In the near future we hope to start offering real solutions to our users' problems with guided lectures, access to professionals, and real pathways to treatment or help.